Well, here is something I always use, and always forget how it’s done. 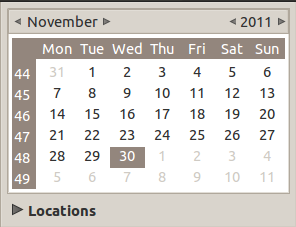 By default, the Gnome calender shows the 1st day of the week as Sunday. It can be easily changed. Then edit your en_US file and change the value of first_weekday to 2. If you wish to make Tuesday your first weekday of the calender, set it to 3 and so on. Now we need to restart gnome’s panel cause the calendar is on it, it need to be refreshed.